Book Review: Noo Saro-Wiwa's "Looking for Transwonderland: Travels in Nigeria"
It’s rare to find a travel book on Nigeria – that’s purely because Nigeria really doesn’t have a tourist industry, and people are constantly being warned against visiting Nigeria. I have to say I did read one travel guide on Nigeria, the summer of 2011 when I went to Northern Nigeria and worked as a researcher on a maternal health project. One of my colleagues came with a travel guide and having never read anything travel guide related on Nigeria, I decided to give it a go. I read most of it before I got frustrated at the way the writer painted Nigeria - the greatest thing about Nigeria is the people (and nothing else), the Agama lizard is the only form of wildlife. So I went into Looking for Transwonderland: Travels in Nigeria hoping for a more rounded description of Nigeria. Born in Nigeria and raised in England, Noo Saro-Wiwa, the daughter of Ken Saro-Wiwa, is a travel guide writer. While she has written several travel guides for both Rough Guide and Lonely Planet, she never wanted to write a travel guide on the country that killed her father. Recently, she decided to come to terms with Nigeria and travel around the country. 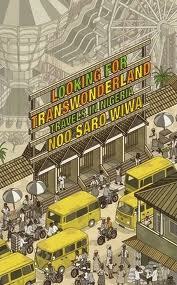 Looking for Transwonderland is a very honest account of Noo Saro-Wiwa’s travels around Nigeria as an adult. From Lagos to Ibadan, Abuja to Kano, Yankari to Jos and Maiduguri, Calabar to Cross Rivers State, Benin to Port Harcourt, and then back to Lagos, we get to see the great diversity of Nigeria through her eyes. And when she wrote about the messages in the ‘Lonelyhearts’, ‘Friendships’ and ‘Relationships’ pages of the Sunday newspapers, as well as the ‘Sugar Cares’, section where men are looking for sugar mummies, I really laughed. Not many people from outside Nigeria travel around the country, and Nigeria has never been painted as a tourist destination, yet Saro-Wiwa portrays Nigeria as it is. That is one of the things I loved about Looking for Transwonderland. Noo Saro-Wiwa has a gift for not only spotting it all – the sights, the sounds, and craziness of Nigeria – but also recreating all that she sees on paper. Yes, she shows the not-so-pretty parts of Nigeria, but she also shows the beauty and diversity, and she does it in a very humourous way. While this is in part travel guide, it is also part memoir as Looking for Transwonderland is also about Saro-Wiwa’s attempt to get to know Nigeria. I was initially unsure if Looking for Transwonderland would showcase anything new about the country to Nigerians. But as I read I thought that if you’ve lived (or visited) some parts of Nigeria, you will definitely be able to relate – I’ve travelled around Northern Nigeria and so could relate to those sections. If you haven't been to certain parts of the country – I’ve never been to Calabar, Cross Rivers, Benin and Port Harcourt – you might be able to learn something new, or at least travel to those places through the pages of the book. For those who know very little about Nigeria this book will actually provide excellent insight to the country. Nigeria isn’t a tourist destination but in Looking for Transwonderland, Noo Saro-Wiwa bravely travels around the country to create a travel guide, and at the same time, make sense of the country. This is a very humorous travel memoir, which I would recommend. In fact as I read it, just as I felt when I was reading Teju Cole’s ‘Everyday is for the Thief’, ‘Looking for Transwonderland’ would be a great novel to get a first-time visitor to Nigeria to read. I just saw this book mentioned in The Guardian's list of the ten best contemporary African books. http://www.guardian.co.uk/culture/gallery/2012/aug/26/africa. I'm definitely intrigued by the idea of a Nigerian travelogue by someone from Nigeria.